Ask an average person today, 'How much square meal do you eat per day?'. His/Her response will be two. And the two at times is not nutritious enough. And this is due to poverty (inability to provide for the basic necessities). According to the World Health Organization (WHO), An individual who can not afford a three square meal is classified to be poor. In economics, human wants are insatiable, but the resources to satisfy them are limited. Meaning resources are less than (<) wants. Then the next question is 'How can we break the chain of poverty?'. 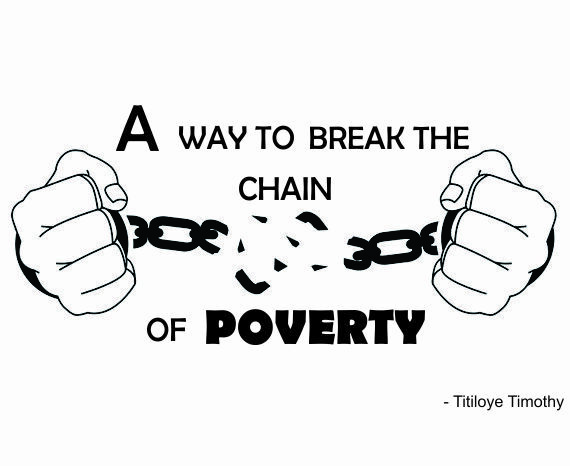 Breaking the chain of poverty lies in our (individual's) hands. The slots available for individuals in the labor market is very few or slim. So when the few are employed in the offices, should the rest of the unemployed go and start begging or kill themselves or even start stealing?, No. This is when the spirit of entrepreneurship comes in. What is entrepreneurship? According to the Oxford dictionary, Entrepreneurship is the art or science of innovation and risk-taking for profit in business. In other words, entrepreneurship is when someone sees opportunity where others are seeing a roadblock and decides to venture into it as a business (innovation) with the aim of making a profit from it (risk-taking). As an entrepreneur, you have to critically study your environment to know what the need gap is and proffer solution to it (innovation). 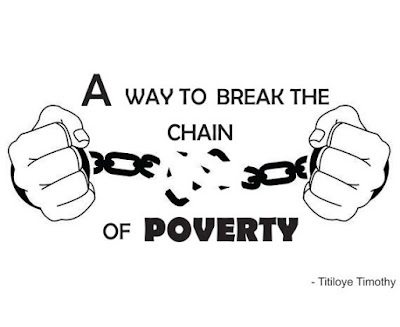 By taking this step you're gradually breaking the chain of poverty. Now, let's assume an individual has successfully created/started his own business. The next thing required is sustained growth. The business set up by the entrepreneur needs to grow in order to start making profits. I'll recall my statement earlier when I said that Breaking the chain of poverty lies in our (individual's) hands... An average person today has several social media accounts such as Twitter, Facebook, Instagram, WhatsApp, etc. Why not make use of these social media account profitably by promoting one business or the other. Or even helping a friend to promote his business. For every log in you make in most of these social media, there is always an infinitesimal profit that enters for the organizations who own it. Why then making the revenue a one-way causation? Why not making it a two-way causation where the both parties gets profit from it? I guess you understand what I mean. A friend once told me on WhatsApp that he has a little business that sells data at cheaper rates and other related ads. He pleaded with me to help him promote it. I then told him to send a summarized banner of his business which he did. I uploaded the banner to my WhatsApp status. Lo and behold he testified that before the end of that day and days after, he was able to make a very large sales as ever before. And I was like 'woow'. I just fertilized a business at little or no cost. It was really an achievement. Now tell me, will such a friend forget me in the nearest future even when I need his help? The answer is NO on a normal ground (Ceteris Paribus). We spend hours chatting on WhatsApp. So ask yourself. What you have achieved since then?. I watched an India movie back then. But it is so painful I have forgotten the title (I know most of you will remember when I start citing it). In the movie, a man (a Keke napep driver) was in need of something, then another man (the passenger) helped him out. The Keke napep driver had the intention to pay back, but the other man (passenger) told him not to worry. That all he (driver) needed to do is to help three other persons when the chance comes. And he (driver) should tell the three people he had helped to also help three other people and the sequence should continue in such a manner. So the trend of helping three people to help three people to help three people continued to a point that the other man (passenger) that originated the idea was in a costly need. And he could benefit from this trend because the solution to his need is in the hands of someone he had once helped. Are you loving this? . I also love it when someone tweets on Twitter: "Please retweet, my customer might be on your handle"... It gives me pleasure to retweet. I know that with that, I have invested in the business. Why not save a business today when you have the time, because your business might be sick tomorrow. Woow... I am really touched with this. I have learnt a lot from you. Keep on the good works.